Welcome back to Delicious History – the most alcohol friendly site for historical enquiry on the internet. 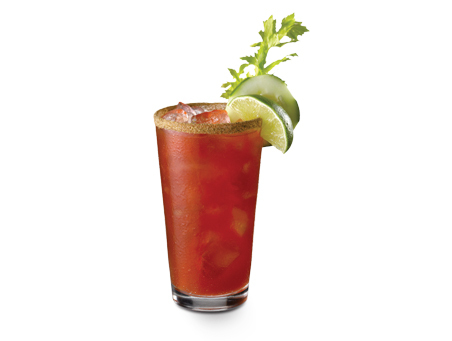 Today we’re going to be drinking learning about the Bloody Caesar Cocktail – a Canadian drink that is used to commemorate the assassination of Julius Caesar. This cataclysmic event fell on the March 15th, also known as The Ides of March. Before we get into the alcohol soaked portion of the post though, let’s have a quick look at what the Ides of March actually is. During Caesar’s rule he established and instituted the Julian Calendar. This was both a precursor to our modern-day calendar, as well as an hilariously self-important move on the naming front. The Julian Calendar didn’t number days of a month sequentially from the first through the last day. Instead, it counted back from three fixed points of the month – the Nones (5th or 7th, depending on the length of the month), the Ides (13th or 15th), and the Calends (1st) of the following month. The Ides occurred near the midpoint, which was the 13th for most months, but the 15th for March, May, July, and October. The Ides were supposed to be determined by the full moon, thus reflecting the lunar origin of the Julian Calendar. The Ides of each month were sacred due to its lunar association, however, the Ides of March was celebrated in particular due to also being a feast day. This feast was in celebration of Anna Perenna , a goddess whose festival concluded the ceremonies of the new year. The day was enthusiastically celebrated among the Roman people with picnics, drinking, and revelry. I think we need to bring this festival back. So, how did this cocktail come to be? It was invented in 1969 by restauranteur Walter Chell in Calagary in order to celebrate the opening of a new Italian restaurant in the city. Chell said his inspiration came from Italy, recalling that in Venice, they served Spaghetti alle vongole – a dish containing tomato sauce and clams. He reasoned that the mixture of clams and tomato sauce would make a good drink. He was correct, because the Caesar quickly became a popular mixed drink within Canada, where over 350 million are consumed annually. In fact, annual Best Caesar in Town events are incredibly popular. For the 40th anniversary of the drink’s invention, people were encouraged to create variants, some of which included glasses being rimmed with coffee grinds, the inclusion of maple syrup and the use of bacon-infused vodka. Today, the popularity of the drink, as well as its name, have given birth to its association with the Ides of March. Personally, I think that the Canadians have the right idea. Lets get March 15 back to its roots – by being a day of drinking and debauchery. In the Middle of Lent. Surely the Catholics won’t mind…right? Have a safe March 15th, everyone. And remember – Beware the Ides of March…or at least have a drink to celebrate it. Did you enjoy this post? Would you like to hear it in your earbuds? If so, I humbly ask you to take the time to donate $1 to the Delicious History Podcast Project. Only $500 is needed make this dream a reality, and all donations over $10 receive a reward! Nothing I could say would do this picture justice. After a bit of a hectic hiatus, I’m back to serve you up some of the most delicious food related tales from history. My friend Sally wanted me to write a post on Pancake Day, and although it’s quite late, I’m still sticking to my word. In any case, pancakes are always worthy of examination so I doubt that anyone is going to get too upset over my tardiness. 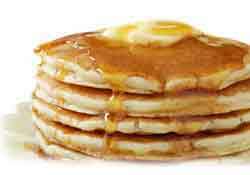 Pancake Day, or Shrove Tuesday, is an annual event that falls 47 days before Easter Sunday. As such, the date varies from year to year and can fall anytime between 3 February – 9th of March. Pancake Day is of course the last day before the period of Lent begins, a time of strict abstinence that ends with Easter. The name ‘shrove’ is derived from the old word ‘strive’ which means ‘to confess’. During the Middle Ages, people would confess their sins on Shrove Tuesday and ask for absolution from God before the commencement of Lent. So how did pancakes come to be associated with such an important and solemn Christian tradition? As previously mentioned, Lent is a time when one would give up luxuries, particularly those of the culinary persuasion. Traditionally, eggs and butter were two items that used to be forbidden during the time of Lent as they were considered to be a luxury. It’s believed that pancakes were made in order to use up the leftover eggs and butter. In modern times, people tend to be more inclined to give up things such as chocolate. A modern-day Pancake Race. I seriously would love to get in on this action. One of the more amusing traditions surrounding Pancake Day is the Pancake Race, which began in Olney, England in 1445. The contestants, traditionally women, carry a frying pan and race to over a 415 yard course to the finishing line. 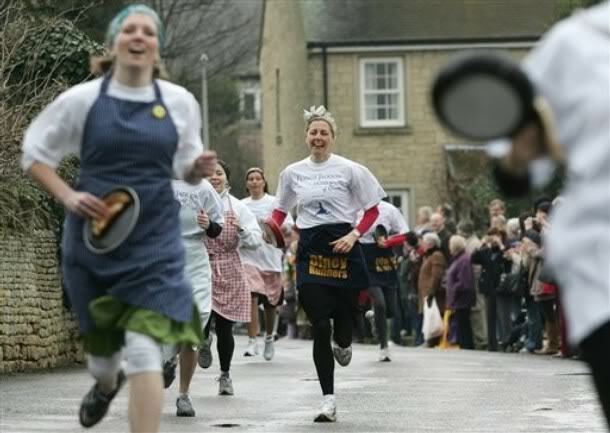 The rules are strict: contestants must toss their pancake at both the start and the finish of the race, as well as wear an apron and a scarf. When men want to participate, they must dress up as a housewife, usually with an apron and a bandanna. This tradition was born out of a story about a woman cooking pancakes on Shrove Tuesday. She heard the shriving bell summoning her to confession, which she was running late for. The cut off time was 12pm, so she ran to church wearing her apron and still holding a frying pan with a pancake in it. The result of this was a tradition that has now lasted for over five hundred years. Welsh Pancakes – Also known as Welsh Cakes or Light cakes. They are made with sour cream and buttermilk, spread with butter and then piled on top of one another. Sometimes, various ingredients such as fish, cheese, sugar or jam (not altogether, gross) are added between each layer and then the pile is cut into quarters. Gloucester Pancakes – Made with suet, which gives them a rich and grainy texture. They are traditionally served with golden syrup. Harvest Pancakes – Often served to the poor, they are made with a mild ale, powdered ginger, and chopped apples. They are then cooked in lard and given to farm hands. Rich Pancakes – Large and thin, these are made made with cream, nutmeg, and dark sherry before being fried in butter and getting the hell in my belly. France – Mardis Gras, which translates to mean Fat Tuesday/Grease Tuesday. The name refers to the last night of eating rich, fatty foods before the ritual fasting of the Lenten season. Mardis Gras is also the name of the carnival season in New Orleans, which also finds its roots in the preparation for Lent. Celebrations are concentrated for about two weeks before and throughout Fat Tuesday. Brazil – Terca-feira Gorda, which also translates to mean Fat Tuesday. The Brazilians celebrate with a three day carnival that concludes on Fat Tuesday. Iceland – Sprengidagur, which translates to ‘bursting day’. I don’t think that needs any further explanation. Greece – Apocreas, meaning ‘of the meat’. The name is significant because its the last chance to eat meat due to being forbidden during Lent. I think that one of the most interesting facts about Pancake Day, and the Lenten season in general, is its origin. Despite being a Catholic holiday, its beginnings can be found in Saturalia, an ancient Roman festival that honoured the God Saturn. The holiday was celebrated with a sacrifice at the Temple of Saturn in the Roman Forum and with a public banquet. This was followed by private gift-giving, continual partying, and a general carnival atmosphere that overturned societal norms. Naturally, the Catholic Church adopted the festival and turned it into a farewell to all things indulgent, as well as a season for religious discipline. After much consideration and research, I have decided that despite my love of pancakes with maple syrup and bacon, I would much rather party on down with the Romans. Happy (almost) New Year, everybody! All over the world people are getting ready to ring in the New Year. If the line at my local supermarket is anything to go by, a great deal of the celebrating will involve consuming an almost offensive amount of food. Good times! Here in Australia, we don’t really have any specific food traditions associated with New Years, unless of course alcohol counts as a food group. It does, right? This made me wonder whether other nations celebrated with specific food. After a bit of research, my question led me to Europe. The Twelve Grapes of Luck is a Spanish New Years tradition that dates back to 1895. It consists of eating a grape with each chime of the clock at midnight. Anyone who manages to consume all twelve grapes before the last chime strikes will have twelve months of prosperity and good luck.In some areas, it is believed that the tradition also wards away witches and general evil. Nautrally, this is an incredibly difficult feat to concur. Most people end up with a mouth full of grapes that they’re trying to choke down between fits of laughter. So how did this tradition come to be? Surely it must be ancient and sacred. Not exactly. Its origin can be traced back to the end of the 19th century where there was a bumper crop of grapes in Alicante – a southern Spanish province on the Mediterranean. Farmers were going to be left with an abundance of surplus grapes if they couldn’t convince people to buy them. The result was the promotion of eating twelve grapes to celebrate the twelve rings of the bell at New Year. Obviously, this practice caught on in Spain and is even celebrated in Mexico and within Hispanic communities in the USA today. It’s even possible to purchase cans containing 12 pre-peeled grapes for the consumers convenience. Clearly, this fabricated tradition was nothing short of marketing genius. I hope you all have a delicious New Year. See you all next year!